The opening classic Omloop Het Nieuwsblad has been given a facelift . The finale of last year's edition was a copy of the track of the last Tour of Flanders, with its finish in Ninove. In 2019, the Muur van Geraardsbergen and the Bosberg will again play a prominent role in the finale of the first one day race of the UCI WorldTour on European soil. The 74th edition of the Omloop Het Nieuwsblad will take off at 't Kuipke in Ghent, as in the past years. 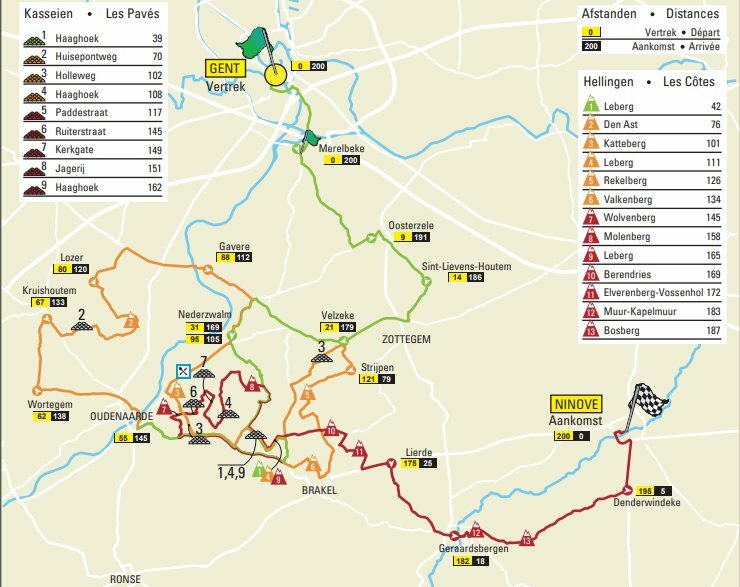 The finish, however, will be moved from Meerbeke to the center of Ninove. The Muur van Geraardsbergen will be the final hill in 2019's edition. From there on, it's still 16 kilometres to the finish. The successor of Michael Valgren Andersen will not triumph on the Halsesteenweg in Meerbeke, but on the Onderwijslaan in the center of Ninove. On March 2nd, Ninove will thus become the epicenter of cycling during thé opening classic of the new season. What's more, he also was part of the infamous group of riders that got outfoxed by Ian 'Yogi Bear' Stannard in 2015. It looked like a nice race. Greg Van Avermaet was mighty impressive on the Kapelmuur and the Bosberg, arguably the strongest of the pack. The rest is classic. When you are too strong and fast in the sprint, every rider is expecting you to catch every attack. So Stybar attacked, the rest are looking at each other waiting for the other one to counter and the bird is flying. In a way you might say it's Andrei Tchmil's theory "when you are strong, don't show it" but Greg had to attack otherwise the bunch would've been too big. It's not an undeserved victory for Stybar. He took his chance and it prevailed. His credit. But he wasn't the best and probably himself would admit it. I was out of touch with road cycling lately and didn't know that Tim Wellens was scheduled to race Omloop. It should've been one of his career first cobbled semi-classics and 3rd already is nice to see.